Elizabeth Arden just released a new line of perfume called UNTOLD, just in time for the Holiday season! The UNTOLD line is perfect gift for her as these perfumes are designed with personality traits of the multi-faceted woman in mind. 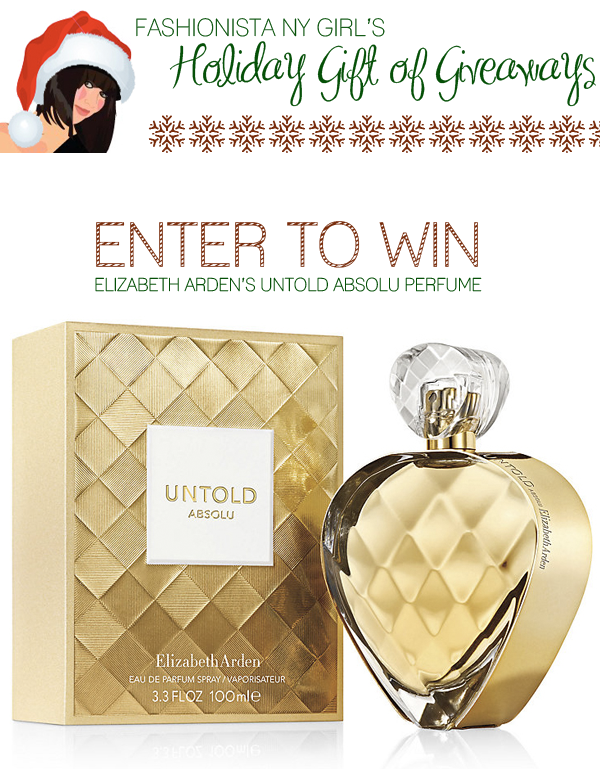 One lucky reader will win bottle of UNTOLD Absolu from Elizabeth Arden. If you have a woman on your list that is more glamourous and mysterious then the UNTOLD Absolu is perfect for her. UNTOLD Absolu is a deeper and more rich smelling. It has luxurious floral scents, red plums, and black berry accents with a amber base which helps marry all these scents. If you have a mysterious and vibrant modern woman on your list the UNTOLD Eau de Perfume is perfect for her. This perfume is full of feminine florals and fruity scents that captures this woman. If you have a woman on your list that wears her heart on her sleeve the UNTOLD Eau Legere is for her. This bottle is filled with light airy scents of green apple, grape fruit and purple freesia. Enter below to win your very own bottle of Elizabeth Arden's UNTOLD Absolu. There will be only ONE lucky winner. Contest ends Sunday 12/07 at Midnight. No purchase necessary. Ooo, I love the gold sequined cocktail dress above! Also, the bottle for Untold Absolu is so pretty.